Pest Monitoring Pheromone traps can be used to monitor for cutworms, but use them in combination with field scouting. 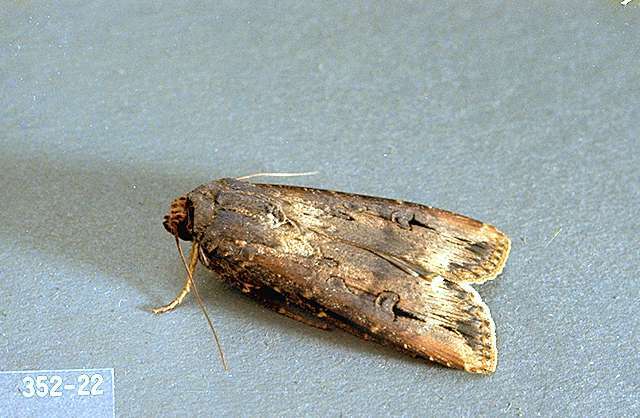 Pheromone traps capture male moths only. Following a particularly mild winter, gravid (pregnant) females overwinter in field boundaries and can infest corn plantings undetected by pheromone traps. Pheromone moth trap counts in excess of two black cutworm moths per trap per day indicate significant egg-laying pressure. 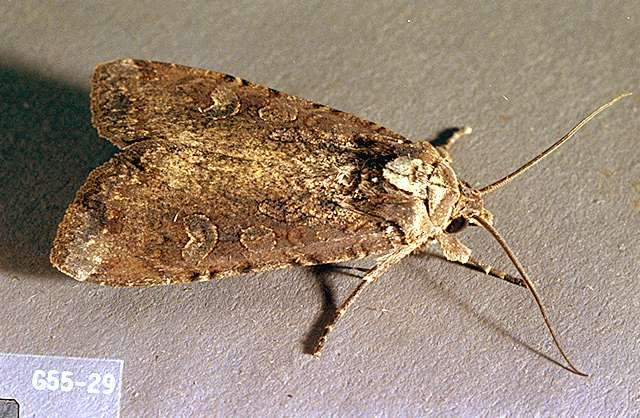 It is useful to check moth counts prior to making a pesticide application decision at planting. When significant (greater than two moths per trap per day) moth counts are detected, intensify your field scouting during crop emergence. Since extensive damage may occur in a short period of time, inspect new sweet corn plantings frequently. Check sweet corn fields at emergence. If a black cutworm infestation is caught early, post-plant insecticide applications can rescue an unprotected planting. Frequently, the damage is most serious at the edges of a field, but stand loss can occur in a spotty pattern throughout the field. Usually, it is necessary to dig in the soil to find black cutworm larvae and to determine the extent of the infestation and the size of the cutworms involved. Larvae normally hide in the soil around the base of the corn seedling or under debris on the soil surface during the day. They are active, voracious feeders at night. In North Carolina, an economic threshold of 5% injured plants has been established for cutworm infestation of corn plantings during the first 3 weeks after establishment. In Ontario, Canada, the guideline for black cutworm on many seedling vegetables is also 5% plants infested. In Nebraska, in field corn, scouting begins soon after emergence and continues through the four-leaf stage, at least every 3 days. Black cutworm populations vary dramatically from year to year. 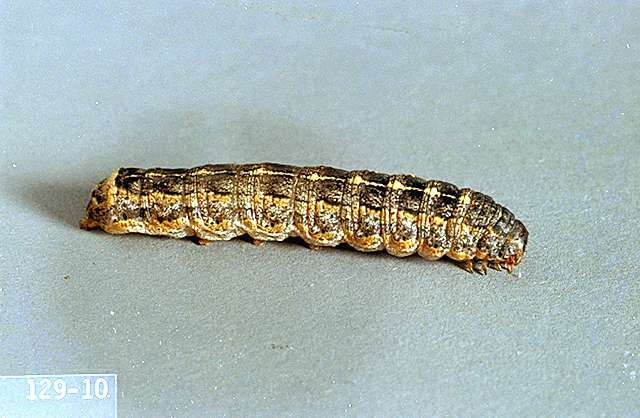 Variation in cutworm populations is caused by overwinter survival, which is regulated by weather, natural enemies, and disease in the cutworm population. Cutworms are attacked by a number of predators, parasites, and diseases. Many of these natural control agents are not effective on pale western and black cutworms because of their subterranean nature. It is not known if any of these natural enemies can control cutworm populations completely, but their presence should be noted and taken into consideration when making a pesticide application decision. Several strains and products of Bacillus thuringiensis (Bt) are available. Early-season sampling, detection, and treatment when the larvae are small are critical steps to successful results with these products. 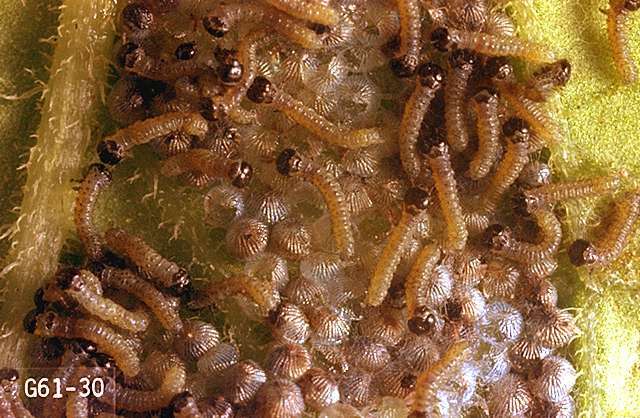 Larvae half-grown or smaller are most susceptible. Crops with dense foliage require the higher label rates. Evening applications and a suitable spreader-sticker contribute to success. Not effective on subterranean cutworms. Cutworms are most injurious in weedy fields with high plant residue and weedy field boundaries. Organic sweet corn plantings are especially susceptible to black cutworm infestations due to these factors. Clean tillage and clean field boundaries reduce risk of black cutworm damage by removing overwintering sites. Historically, cutworms are a problem in early, spring-seeded fields. Tillage prior to seeding may reduce cutworm populations. A thorough harrowing between established plantings may reduce cutworm damage. Apply any one of these materials to the soil surface at first sign of cutworm activity. Consult label. Minimum preharvest interval (PHI) varies with crop. Difficult to control. Where cutworms are on the soil surface, a carbaryl drench (when bees are not present) may help. Beans, tomatoes, and late corn are most often "hoed" by cutworms. Attack varies in severity with locality and year. alpha-cypermethrin (Fastac EC) at 0.014 to 0.025 lb ai/a. PHI 3 days. REI 12 hr. Retreatment interval 3 days. Do not exceed 0.075 lb ai/a per season. Bacillus thuringiensis (Javelin, Xentari) at 0.12 to 1.5 lb/a. PHI 0 days. REI 4 hr. Slow acting. May need multiple applications. Add an appropriate spreader-sticker to enhance control. Most effective on small larvae. Some formulations are OMRI-listed for organic use. beta-cyfluthrin (Baythroid XL) at 0.007 to 0.013 lb ai/a. PHI 0 days. REI 12 hr. Retreatment interval 2 days. Do not exceed a total of 0.22 lb ai/a per growing season. bifenthrin (Capture LFR) at 0.04 to 0.16 lb ai/a at planting; 0.047 to 0.062 lb ai/a pre-plant incorporated; 0.04 lb ai/a pre-emergence; 0.033 to 0.1 lb ai/a foliar. PHI 1 day for foliar. REI 12 hr. Do not exceed 0.2 lb ai/a per season. bifenthrin/IBA (Empower 2) at 0.002 to 0.006 lb ai/1,000 linear feet of row. PHI 30 days. REI 24 hr. Do not exceed 0.1 lb ai/a at plant application. carbaryl (Sevin 5 Bait) at 2 lb ai/a. PHI 2 days for harvest of ears, 14 days for forage, or 48 days for fodder. REI 24 hr. Retreatment interval 3 days. Limit 8 treatments per year. Do not exceed 16 lb ai/a per year. chlorethoxyfos (Smart Choice 5G) at 0.15 to 0.25 oz ai/1,000 row ft. REI 48 hr, or 72 hr if annual rainfall is less than 25 inches. chlorpyrifos (Lorsban 4E) at 0.5 to 1 lb ai/a. PHI 21 days. REI 24 hr. Limit 3 treatments of any chlorpyrifos product. Retreatment interval 10 days. Do not exceed 3 lb ai/a per season. Consult label for application details. clothianidin (Poncho 600) at 0.25 to 0.5 mg ai/kernel seed treatment. Not for use in hopper-box, slurry-box or similar applications. Use in liquid or slurry treaters. cyfluthrin (Tombstone) at 0.013 to 0.044 lb ai/a. PHI 0 days. REI 12 hr. Retreatment interval 2 days. Do not exceed 0.44 lb ai/a per season. deltamethrin (Delta Gold) at 0.012 to 0.018 lb ai/a. PHI 1 day. REI 12 hr. Do not apply more than 0.45 lb ai/a in one growing season. ethoprop (Mocap 15G) at 3 lb ai/a before planting to at-plant. Incorporate. REI 48 hr, or 72 hr if annual rainfall is less than 25 inches. lambda-cyhalothrin (Warrior II) at 0.02 to 0.03 lb ai/a broadcast. PHI 1 day. REI 24 hr. Do not harvest for feed or graze livestock for 21 days. Retreatment interval 4 days. Do not exceed 0.48 lb ai/a per season. methomyl (Lannate SP) at 0.45 lb ai/a. PHI 0 days for ears, 3 days for forage, and 21 days for stover. REI 48 hr. Do not exceed 6.3 lb ai/a per season. permethrin (Ambush 25WP, Pounce 25WP) at 0.1 to 0.2 lb ai/a. PHI 1 day. REI 12 hr. Retreatment interval 5 days. Do not exceed 1.2 lb/a Ambush or 0.8 lb ai/a Pounce per season. tefluthrin (Force 3G) at 0.008 to 0.009 lb ai/1,000 row ft (0.12 to 0.15 oz ai/1,000 row ft). REI 0 hr. Use either at planting or lay-by. Only one application per year. thiamethoxam (Cruiser 5FS) at 0.125 to 0.80 mg per kernel (formulated product) planter box and seed treatment. zeta-cypermethrin (Mustang) at 0.028 to 0.05 lb ai/a. PHI 3 days. REI 12 hr. Do not exceed 0.3 lb ai/a per season. Retreatment interval 3 to 5 days.